A fellow Boston-born actor, Edward Norton, made his film debut in 1996 with Primal Fear beating out 2, 100 other actors for the role, including Matt Damon. Apparently,” When Norton met with the director for Primal Fear (1996), he told them that he, like Aaron, came from eastern Kentucky. Norton even spoke with the twang, which he prepared by watching Coal Miner’s Daughter (1980. )”–From IMDB. Additionally, “According to the Blu-ray behind-the-scenes information, it was Edward Norton’s idea to stutter as “Aaron,” as it appeared nowhere in the original book or script. 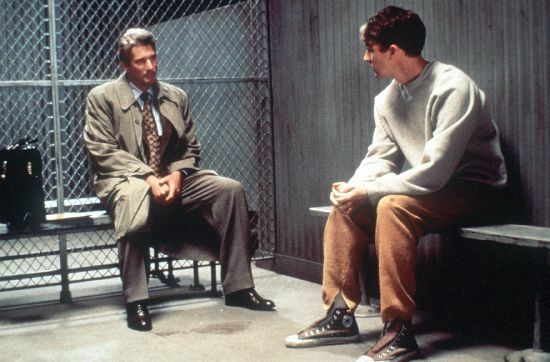 In addition, when “Roy” shoves Vail (Richard Gere) against the prison cell wall, Gere’s shocked reaction is genuine, as that was another Norton ad-lib. Yet another Norton ad-lib is Roy’s slow clap at the end just before the exposition when Vail realized what had happened.”–From IMDB. Edward Norton has always been an interesting actor for me to keep up with. He’s intelligent (he went to Yale.) He’s multilingual (he speaks Spanish and Japanese.) The fact that he managed to fool the casting director and production team with his accent is really impressive too. He’s gone on to star in blockbuster films and even received an Oscar nomination for his film debut. I think he was amazing in the role, and the praise is more than justified. I’d love to work with him one day, just to witness his process. I’ve always been impressed with this film and with his performance. Agreed. Brilliant (and even humane) guy. Top notch actor. I’m a fan too. I have always been such a huge fan of Edward Norton! He is so amazingly talented. Thanks for sharing this, it’s fascinating…and such a gutsy thing to do.